Great dress for many events. Weddings, Prom, Dress up or Tea Party. Many option with this beautiful dress. New with tags! The dress is new and it is high quality. Very elegant and classy style with flowery appliques. Pink Black V Neck Puddle Maxi Dress Beautiful New Puddle Maxi Dress. V Neck Attached Tie Sash Half sleeves Full Skirt Stretch Knit Fabric. More Styles and Colors Here. Pink Scoop Neck Puddle Maxi Dress Beautiful New Puddle Maxi Dress Scoop Neck Attached Tie Sash Half sleeves Full Skirt Stretch Knit Fabric. CLEARANCE . Brown Chevron V Neck Puddle Maxi Dress Beautiful New Puddle Maxi Dress. V Neck Attached Tie Sash Half sleeves Full Skirt Stretch Knit Fabric. More Styles and Colors Here. 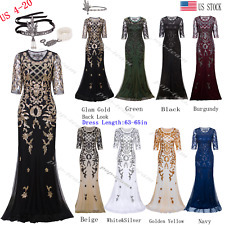 The dress is new (directly from manufacturer) and it is high quality. Very elegant and classy style. The attached pictures show the actual dress. Spot clean. waist: 27 in. Missing beads throughout. Extra bag of beads included. See all photos. Item #5520461. Blue Green Hawaiian V Neck Puddle Maxi Dress Beautiful New Puddle Maxi Dress. V Neck Attached Tie Sash Half sleeves Full Skirt Stretch Knit Fabric. More Styles and Colors Here. Relaxed Loose Fit, Unique Stunning Artistic Design. Sophisticated and stylish. No holes, stains or flaws. Excellent condition. Petite size. Lovely soft fabric. Otherwise the sale is final and we will not be able to cancel it. Beautiful custom made dress for size 8. Worn once for a wedding. Super cute with a ribbon belt! Julian Wilder Black Layered Dress With Broach 3/4 Sleeve Size 10 EUC. Condition is Pre-owned. Single clasp closure on back. Fabulous Women’s Plus Size 18 Stretchy Jessica London Designer Brand black Dress. Condition is Pre-owned. Shipped with USPS Priority Mail. Gianni Bini Dress Size Large, Short Vibrant Purple With Lace Trim New. Shipped with USPS Priority Mail. The dress is light with a 3/4 sleeve and a beautiful front. lovely day dress. Condition is New without tags. Shipped with USPS Priority Mail. My Story Nordstrom Womens S Dress brown and black Stretch Small. Condition is Pre-owned. Shipped with USPS First Class Package. The dress is new and it is high quality. Very elegant and classy style. PISARRO NIGHTS Navy Blue Silver Beaded Floral 3/4 Illusion Sleeve Gown. By Pisarro Nights; imported. All beading and sequined art work on this gown are done by hand. 100% rayon. Back zip closure. Machine wash. - 95% Polyester/5% Spandex. Product Details. Nina Leonard Dress NWT Burgundy/Black/white 2X vneck very flattering! Burgundy, black and white. Faux wrap front. Length 32.5". Armpit to armpit 20.5". Beautiful dress from the famous cult designer. LuLaRoe Julia Dress gorgeous! Fits Sizes: 6-8. Casual Handkerchief hem dress with pockets. Made of soft jersey material. More Styles and Colors Here.